In much the same way that walking down the street with a cute puppy attracts comments and conversation, keeping in touch with your heifers after they sell often brings great exchanges and insights from other dairy breeders. Three months ago we at The Bullvine started communications with the Crosbie Family of Caron, SK (one hour west of Regina). 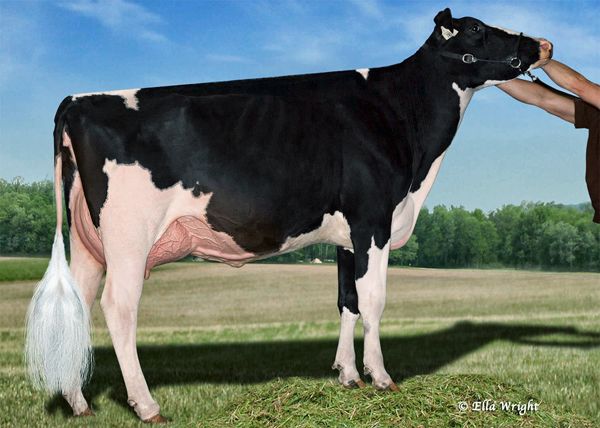 Our mutual interest was a Huntsdale bred cow, Shottle Crusade, who had classified EX93. A mutual friend then emailed us that Crusade had won the 5 yr old class at the 2012 Westerner Show in Red Deer and vouched that he heard “many individuals around the ring say that she could be the nicest Shottle daughter in Canada”. Biased friendships aside, hearing that she went on to HM Senior Champion inspired us to exchange emails and then talk on the phone to Ian Crosbie. Once again, what starts out on the cattle trail ends up bringing people together too! 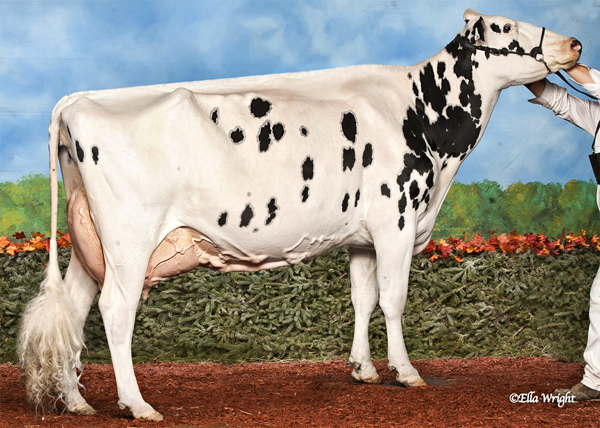 At twelve Ian showed a great interest in Holstein breeding, so his parents, Neil and Betty Jean, and his uncle Blaine gave him the responsibility of selecting the sires to be used on the Benbie herd. Back then the Crosbie’s milked 90 cows through a parlour and housed the cattle in pack barns. Ian had the challenge of choosing sires for both their commercially oriented operation and also those that he and his siblings would take to 4H shows. Folks we need to remember that Caron SK is not downtown central for the Canadian Holstein breed and believe it when Ian says that he read every book and magazine he could get his hands on and talked cows with Holstein breeders whenever and wherever the opportunity presented itself. 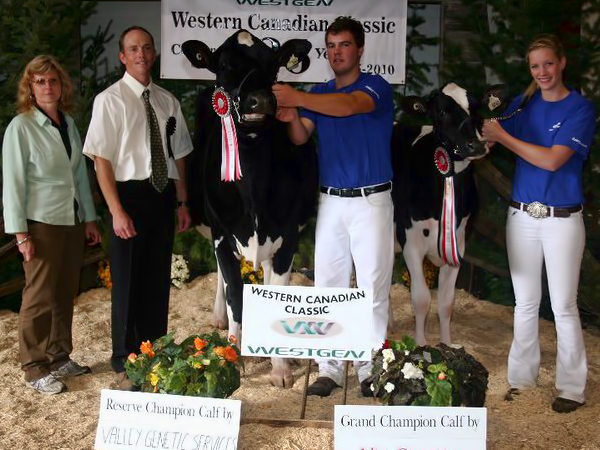 Ian Crosbie (2nd from right) – showing the Reserve Champion calf at the 2010 Western Canadian Classic. All the Crosbie children have been encouraged and supported in attending college or university. For Ian that meant attending Lakeland College in Alberta. Along the way he helped show herds and took part in every 4H competition that he could. It was in fact through 4H that he met his future wife, Nicole Hylkema who was from Chilliwack, British Columbia (Hyljon Holsteins Ltd.). What started out as competition at the Western Canadian 4H Classic has developed into a lifelong relationship as Ian and Nicole are now husband and wife. After college Ian spent some time working and showing cattle for other herds, while Nicole got her university degree in Ag Business at the University of Saskatchewan. In January of 2012 Ian and Nicole returned to Benbie and joined the farming operation with his parents after his uncle left the dairy farm. Since then, another pack barn has been built, quota has been purchased and the parlour updated and expanded to a double twelve. 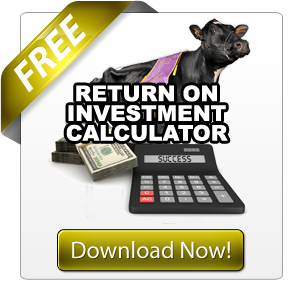 Prior to the expansion, the 90 cows were all housed on one bedded pack. Benbie Holsteins are now milking 135 cows and have put up another addition, which includes two more packs. One of the packs is for first lactation animals and the second pack is large enough for 6-8 head, which will be for show animals. The remainder of the herd is housed on the original pack. These changes are already results. To answer your question the herd’s diet is the common one for Western Canada: barley silage, alfalfa haylage, some dry hay, rolled barley and supplements fed as TMR. Sold to Silvermaple Holsteins B.C. 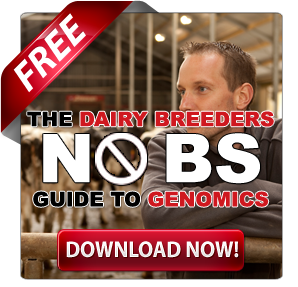 Benbie uses 3-4 proven sires at one time and have started using a variety of genomic bulls. Current daughter proven sires are Fever, Lauthority and Windbrook. 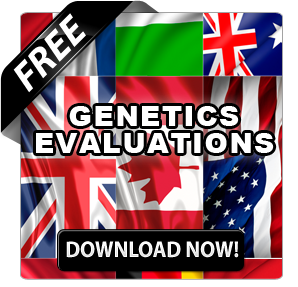 Genomic bulls used over the past year include- Meridian, McCutchen, Gold Chip, Day, Sajac, Numero Uno, Shamrock, Hefty, AltaHaley and Airlift. 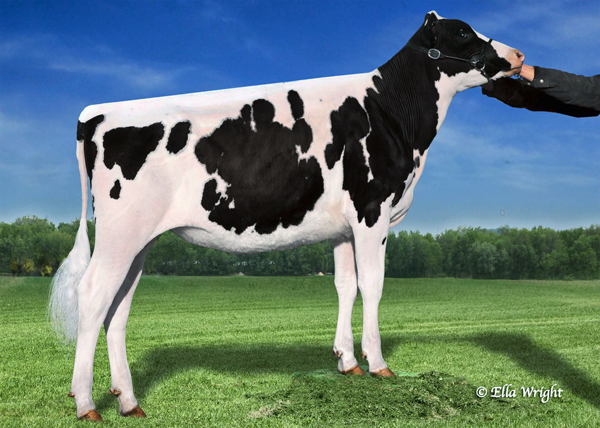 Before we return to Crusade who brought us to Benbie Holsteins in the first place, let’s take a quick look at other more recent heifer purchases which include: Windy-Know-View Pasian (Braxton x Pledge) due in June to Gold Chip; Speek-NJ Chrm Debbie Rae (AltaChairman from the Roxie Family) due to AltaHaley; and Winright Bolton Sugarshack (Bolton from the Splendor Family) who did well at shows in 2012 and is due to Windbrook. Ian was pretty sure great things were ahead for Crusade. “When Nicole and I arrived home in early January, Crusade was in the close-up pen. She had grown into quite a cow. We were excited to calve her in and, a month after freshening, we began to prepare her for the upcoming spring shows. As part of our first full string as Benbie, Crusade did not disappoint. She was named Grand Champion of the Western Canadian Livestock in Saskatoon in April. Throughout 2012 Crusade won or placed high at four shows. 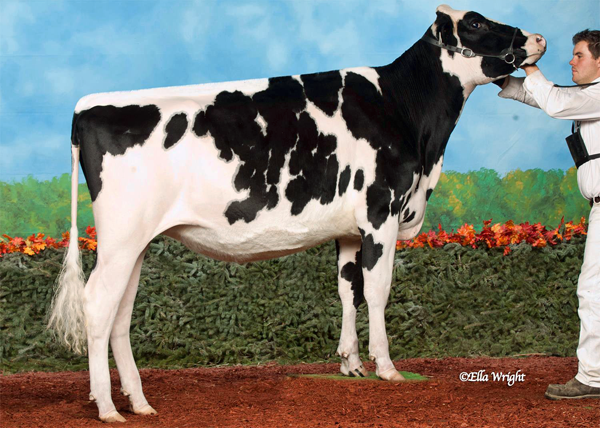 She is now scored EX93 and continues to develop. She is completing her third Superior Lactation, with an average 4.2% butterfat and low SCC. She was flushed twice give 25 good embryos and is now short bred as we are hoping to have her back for the 2013 show season.” What an incredible first year at Benbie for Ian and Nicole. It seems quite obvious that this young couple have a vision for where they are going and can offer advice to others who are starting out too. 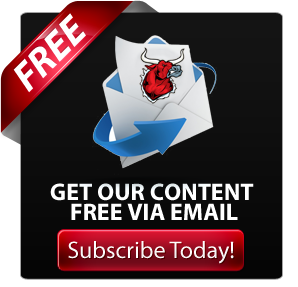 “Being relatively young, we are always looking for more advice on showing and marketing top cattle! Lots of people are willing to give advice and opinions, but the best advice always comes from those that have been successful.” They continually seek out and share with other breeders and Benbie Holsteins can be followed on Facebook (http://www.facebook.com/BenbieHolsteins). Sometimes we make our path into the future far too complicated. Ian suggests that moving forward can be summed up quite simply. “Be open minded. Don’t be afraid to try new ideas. The moment you stop progressing you being regressing.” What good advice that is coming from someone who has already launched a Crusade!